It’s winter, cold and chilly. Time to have a rest from regular grooming and let their hair grow long to keep them warm and cozy, right? WRONG! Long haired dogs need to be groomed more regularly during the cooler months in order to keep the desired length slightly longer for warmth – but maintain that length before it becomes matted! Keeping the coat longer and MATT FREE can be a balancing act. It will require extra brushing and more regular visits to your groomer. The longer the coat the more likely the coat will matt causing discomfort, skin problems and restricted movement. When the matt is removed it generally needs to be taken quite close to the skin resulting in a short not so pleasing hair cut. REGULAR GROOMING WILL KEEP THE DESIRED LENGTH FOR WARMTH. Our lifestyles and the role that our furry family member play, often mean that they spend just as much time inside as they do outside. 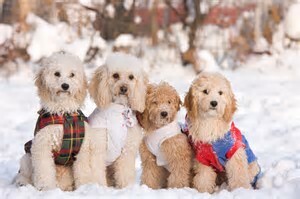 This can confuse what the coat was designed to do – one minute the hair follicles need to grow to keep your pet warm while outside; the next, they need to shed with the heating on inside. Double-coated breeds such as Samoyed, Golden Retriever, Pomeranians have coats that are designed to thicken up for insulation, but often live indoors in our heated environment during winter. Regular brushing will remove the shedding hair thus avoid matting, keeping your pet balanced temperature-wise, save on vacuuming and in turn stimulates and conditions the skin and coat. Breeds such as Shih Tzu, Maltese, Poodle and Designer Oodle require regular trimming and brushing. These breeds have an undetermined hair length and when it gets too long it can become matted. When they malt the hair becomes trapped in the coat also causing matting. It is important to brush your dog removing any tangles or matts. Did you know to make the matt worse, just add water? If you find that you didn’t get to the groomer quick enough and your pooch is matted. Don’t worry, better late than never and kinder to address the issue. If the coat has to go shorter than hoped, just get a nice warm coat for a little while.